Since my Prickly Pear has come on I can begin to harvest the paddles -- the nopales -- for eating. This is a plant we KNOW grows in Queensland. Indeed there are twenty PP species that have naturalised into Australia. Of these all but one species -- Opuntia ficus-indica-- are classed as weeds. In Melbourne the Opuntia ficus-indica fruits (called 'Tuna' in Spanish)are sold in fruit and veg shops...as any fool (like me) soon knows after they touch them without the tongs provided.. But you also eat the paddles -- 'leaves' -- and that was my main interest in growing the cactus. Pick the paddles at the size of your hand. Nopales are a severely under-appreciated vegetable. They are what a green pepper could only hope to be (well, if it was not allowed to turn red, that is). Nopales have a bright, refreshingly clean green taste. Maybe like green beans spritzed with kiwi. But subtler. And they are quite nutritious, too, being a good source of Vitamin C, manganese, and calcium. It is most commonly stir-fried / sautéed with onions and served alongside meat. It is great for fajitas, tacos, and even in egg dishes. (Indeed, huevos con nopales [eggs with nopales] is a common dish in Mexican cuisine). The only drawback for some (the spines notwithstanding) is that cactus is a succulent, meaning it stores quite a bit of mucilage (aka slimy goo). So if you don't like slimy foods, you may not like nopales. But if cooked at a high heat, the mucilage dissipates some. And like okra, you can use the mucilage to your advantage, giving your dishes a more moist mouthfeel. This is my preferred size. I've tried grilling the paddles whole on a bbq and I've seen recipes that suggest that, but I'm not a fan of the slime. Oh yeah, did I mention that nopales are naturally slimy? I guess I should have before you got this far! There's an easy way to reduce the natural babas though; get a pot of water boiling and throw in the nopalitos. After about 5-6 minutes of cooking you'll notice the water is thick and gooey. Dump all of it in a colander, rinse the nopalitos, bring some more water to boil and repeat. By the time you're done the nopales will be cooked and much of their natural "slime" will have been released in the boiling water. Drain well. For the curious, this is what ensalada de nopal looks like (Nopal salad) and for DIY cooking try this link: How to Cook Cactus Paddles (Nopales) / Cómo Cocinar Nopales. However, since I just munched my way through half a raw paddle, I point out that they can be eaten raw. My nopal was a young one that did not even require trimming of spines. I thought it a surprising taste so did some research. Serve the raw nopalitos as a simple appetizer by putting the strips into a shallow bowl and covering them with freshly squeezed lime juice. Top with a sprinkling of paprika and let sit at room temperature for a few minutes before serving to allow the flavors to mingle. Cut the strips of raw nopalitos into small squares. 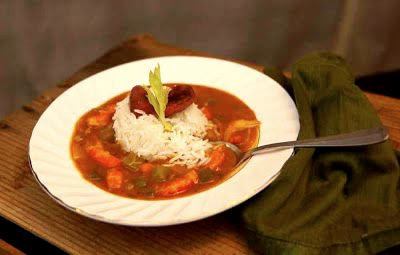 Toss with chopped cilantro, ripe tomatoes, avocado, red onion and a minced chili pepper, such as a serrano pepper. Mix gently with a dressing prepared from olive oil and lime juice and serve as a salad at room temperature. To avoid the slippery texture, rinse cooked nopales and drain in a colander, cover with a damp towel to keep the pads from drying out, and let stand about 30 minutes before slicing or serving. Sauté nopalitos in butter or oil and serve. Grill until slightly browned, slice into strips and toss with a squeeze of lime and a little bit of olive oil. Dice and cook in an ungreased pan with chunks of onions, one or two cloves of garlic until no longer slippery, about 5 minutes, then rinse. Grill or boil, dice, and add to salsa or salads. Sauté with scrambled eggs, diced onion, chiles, and tomatoes. Sauté bite sized pieces in butter for about 5 minutes then add eggs and cheese to scramble. Cool for 15 to 20 minutes in boiling salted water; pour off the water and rinse in cold water; use in salads, stews, or as a vegetable. Boil, drain and wash with cold water; serve with finely diced tomatoes, onion, cilantro, and jalapeños, season with vinegar, salt and lime juice. Grill and serve with grilled Portobello mushrooms. Dice and sauté bits with chili pepper and sausage or grated cheese in tortillas. 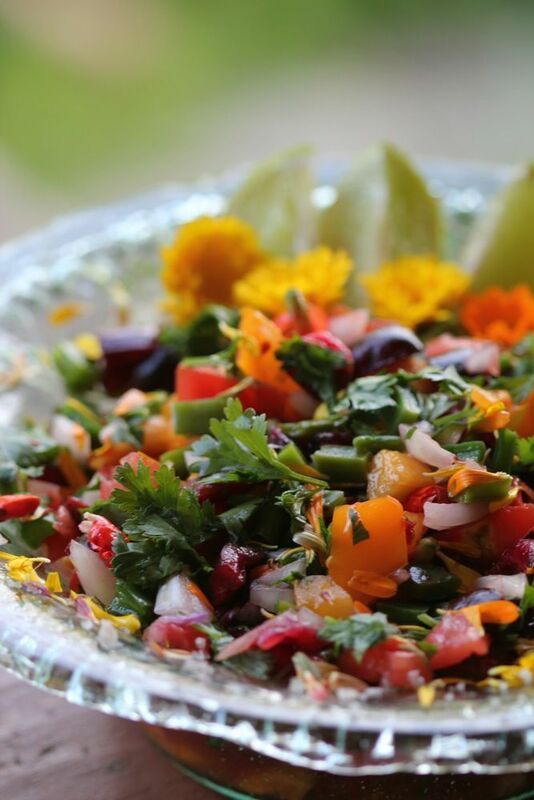 Cut boiled, cooled strips and combined in a salad of tomatoes, onion, oregano, cilantro, chilies, oil and vinegar. Stir squares into soups, about 10 minutes. Stir diced into chili or beans in last the 15 minutes. Slice the pad and sandwich to enclose cheese, then dip in a light egg-flour batter and deep fry. Steam, dice and add to scrambled eggs. As a raw salad veg chokoes can be a bit dry and the skin can be a little tough, even when small. I don't prick them, but scrape them with a fork so that more of the vinegar and other flavours enter the flesh and the line on the skin is broken up. Then I slice/chop them to suit. They are crisper than cucumbers so they can take it. So a little sweating with vinegar and salt works to good effect and drains some of the strong juices from the sliced fruits. Mixed with the lemony hit from the nopales the combo works great. I used apple cider vinegar rather than limes because the lemon edge is there already. I added chopped tomato to tonight's nopales salsa and it didn't work so well. But the bruised Katuk/Sweet Leaf married in deliciously. I'm talking about the small choko -- before the core forms. Even when that happens -- it's OK salading so long as the skin doesn't really toughen up. By then, the chokoes have lost their crisp fresh zing, I reckon. Prep 10 minutes before serving via soaking in the salsa mix. 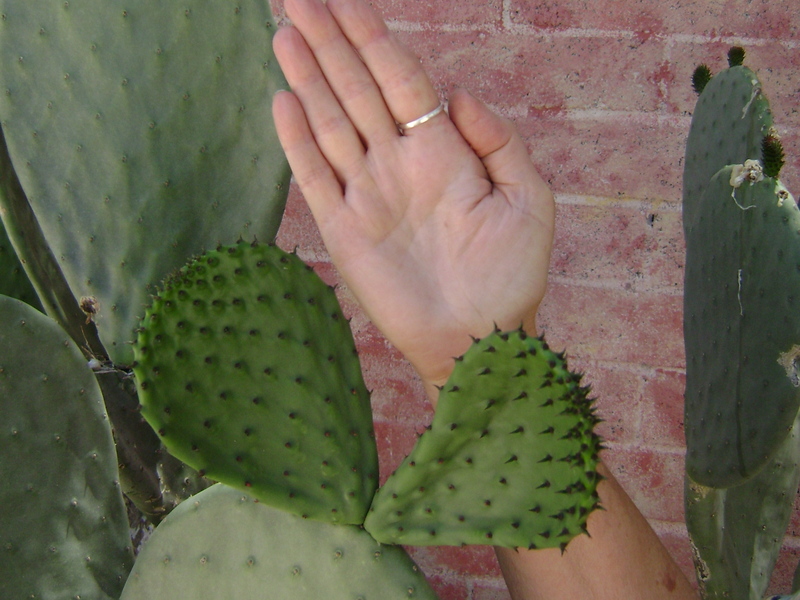 Otherwise the nopales sweat too much and begin to soften. You can treat cucumbers the same way of course; fork 'em rather than peel. But in my house chokoes grow much better than cukes so I've learnt to rely on them more. The classic choko -- chayote --salsa is choko chopped up with with honey dew melon. But it will go well with other light fruits too. Cantaloup? Water melon? I seriously love small chokoes -- starting at about walnut size through to large chook egg-size...until they begin to fill out and firm up. I prefer to roast them then. If I peeled the small ones I'd end up with very little flesh. So I don't bother -- and scarping was my work around. You can also grate the smaller unpeeled chokes whole and then sweat them with salt for 15-20 minutes before mixing them in garliced yogurt for a Tzatziki/Raita. Same way you prep cukes for the dish. I've now begun a new level in my Nopales obsession. After exploring the utility of Opuntia ficus-indica in the farmscape, I've been experimenting here at home with the 'vegetable' both horticulturally and digestively . Because the prickly pear has such a b ad name in Qld it has been overlooked in both urban and rural contexts. My interest in Mexican (and Caribbean) food has been enhanced by this embrace of nopales -- cactus paddles. 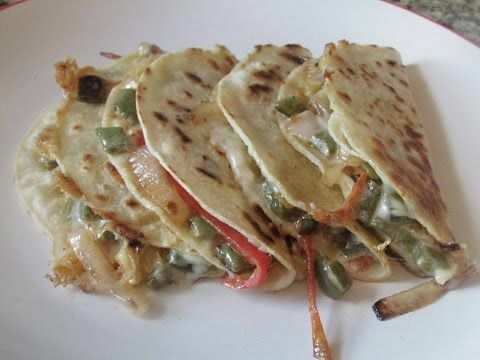 For dinner tonight I had Tortillas in quesadilla mode with a filling of Nopales, egg and cheese. It looked something like the image at left. (But I'm lazy and instead of folding I use two tortillas and flip 'em). While not enamored with standard Mexican restaurant food I am much taken by your humble everyday corn Tortilla. Even that is rare both on the eatery table or the supermarket shelf. So I got myself a Tortilla Press to make my own 'corn flatbreads'. Since my relationship with Rye crispbreads(Knäckebröd) is firing, tackling the Latino options seemed a logical progression. Talk about fresh 'bread': tortillas, fresh made are so darn quick and easy to make...and taste nothing like their supermarket cousins. Anchoring the filling with prickly pear paddles included kinda suits the style. While I have a large stand of Spineless Prickly Pear( Opuntia ficus-indica ) I've been wondering how to extend its utility in my patch.Used as an option or partner to Vetiver for contour management and fodder in extremely dry climates here's one plant you'll know will surely grow no matter how much you neglect it. What with the misses' focus on succulents, my interest in Aloes, Dragon fruit, and Peruvian Apple has enriched my determination to domesticate the humble Prickly Pear. With application, 'what -will-we-have-for-tea' challenges are easier with these paddles on hand. What an extraordinary unappreciated plant! The standard 'cactus' smoothie is usually enhanced with pineapple juice but really, mushed up and with added water, it's pretty tasteless by itself --compared to other greens. I also like them as an alternative to cucumber. However, inasmuch as I can find out, 300 grams of steamed prickly pear cactus pad and 500 grams of broiled stems of prickly pear cactus have been taken as a single dose. Side effects for some people include mild diarrhea, nausea, increased stool volume, increased stool frequency and abdominal fullness. So maybe you may need to ease into your PP lifestyle. There are various ways to prepare Nopales...in tortillas, as a salsa or salad ingredient, fried with eggs(truly excellent flavour and texture) , etc -- but of late my routine is adding diced up paddles to my daily gourmandizing of kimchi. Fresh chopped and mixed in, ensures that there is little sliminess unleashed. The Prickly Pear pieces add crunch to the texture without changing the taste. Prickly Pear padles can be pickled in vinegar (or juiced) but I doubt very much that they would lend themselves to lacto fermentation in kimchi like mode.In trying to reduce the slime you'd cause the death of the lactobaccilae. But like Okinawan Spinach , I'm sure Nopales would thrive in a gumbo, in the absence of okra:LINK.